Companion Apps, or “Second Screen Apps” are taking Hollywood by storm with seemingly every major television show racing to get a companion app ready for download to mobile and tablet devices. 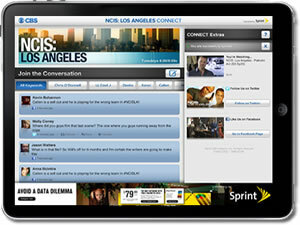 Tuesday, CBS Interactive announced the launch of a companion app for the popular show NCIS: Los Angeles. The app, which is the first show-specific iPad app for CBS, offers fans an enhanced viewing experience for each episode of NCIS: Los Angeles, which premiers September 25th. “As show creators, we are always looking for ways of adding to the audience experience and enjoyment of what we make. So I was very excited when CBS Interactive developed this app,” said Shane Brennan, EP and Creator of NCIS: Los Angeles. The app has been designed from the ground up to give fans of the show a deeper look at what is unfolding on screen, and will have a particular interactive element unlike anything users have seen before. For example, photos and evidence from the episode may be viewable within the app. “The audience will be able to follow the unfolding episode, interacting in real time with each story shift or character interaction. As well as allowing the audience to review the evidence, check out suspects in the story and vote on who they think is the guilty party,” Brennan continued. The app also features a sync option, so that no matter if you are watching the show live each week or viewing through DVR or even on-demand–you can still follow along with the action through the app. For fans of NCIS: Los Angeles who are looking for more ways to get interactive with their favorite show, simply head on over to the App Store and download the free app.